Radiometric Dating: Is the "Decay Constant" Constant? Dr. Anderson is President of ERA Systems, Inc., a technical products business based on a number of patents he has invented. ERA (Evaporative Rate Analysis) involves equipment which characterizes material surfaces. 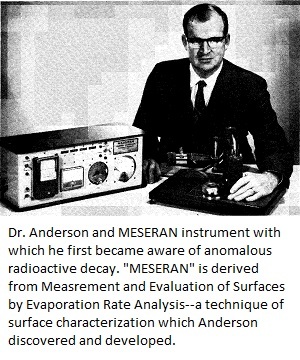 Dr. Anderson first became aware of non-random radioactive emissions in December, 1969. Dr. Spangler is Associate Professor of Physics, University of Tennessee, and Consulting Physicist, Baroness Erlanger Hospital, Chattanooga. Among other requisite assumptions, the validity of radiometric dating procedures, such as the carbon-14 method due to Libby, depends on the thesis that radioactive decay constants are not altered significantly by any possible environmental influence. With the exception of internal conversion and K-capture decay processes which have been shown to be influenced in a minor way as a function of chemical state, radioactive decay constants are assumed in present nuclear theory to be substantially invariable even when the nuclei are subjected to massive environmental changes. Thus much of the earlier published literature (though largely confined to alpha-emitters studied with relatively primitive detection and analytical instrumentation) tends to support this thesis. The close approximations to exponential decay during measurements of half-lives must also be considered strong evidence for substantially invariable decay constants. However, recent statistical evidence of non-random emissions obtained by the authors suggests that even mild changes in the environment may indeed alter the stabilities of the beta-emitter carbon-14 and of the beta-, gamma-emitters cobalt-60 and cesium-137. The divergences from constancy as shown by these non-random detected emissions have not yet been sufficiently characterized to demonstrate a definite effect on radiometric dating procedures. The assumption that single species radioactive isotopes invariably decay at singular and consistent rates—i.e., that the decay constant is constant—is fundamental to the use of such radioisotopes in radiometric dating, as has been pointed out by Libby with respect to carbon-14 dating (1). Other assumptions as to the consistency of the carbon-14/carbon-12 ratio as a function of the formation of carbon-14 and as a function of adequate mixing of the isotopes throughout the world environment must also be made if this radiometric technique is to be useful in providing firm reference values in age-dating of artifacts. Since the authors are primarily experimental nuclear physicists interested in the mode of decay, these latter assumptions are not further discussed in this paper. At least with respect to radiometric dating, the issue of decay constancy under the presently accepted theories of radioactivity depends on the universality of the exponential decay law shown by the plot of log counts (per unit of time) versus time being a straight line. Within this theory, each nucleus decays independently of all other nuclei within its own species and also of any environment-thus the probability that any single nucleus will decay is constant. Only in the cases of K-capture and internal conversion processes have decay constants been observed (and have been confirmed) to vary significantly as a function of environment-and then only to a remarkably small extent (less than a few percent at the outside) (2). These variable isotopic processes (as a function of chemical composition, primarily) are not used in radiometric dating procedures such as Libby's carbon-14 method, and thus the variabilities which have been observed are not necessarily pertinent to the subject at hand. The two independencies mentioned above-of other nuclei within the species and of the environment-are not necessarily related to each other. It is conceivable that environmental influences might alter decay probabilities without involving any internuclear relationships and, vice versa, internuclear interactions, if present, would not necessarily be subject to environmental effects. The mere fact that decay processes can reasonably be described by exponential relationships and that they can be reproduced at differing times within small error by many different investigators throughout the world lends strong support to the thesis of constancy (and independency); it is also true, however, that most investigators use remarkably similar and standardized experimental counting techniques when performing half-life and similar decay measurements. Ultimately testing and proof of the hypothesis of exponential decay must be made using statistical tests of detected emissions. (There is, of course, the further and often unphrased assumption that detected emissions are always and necessarily statistically similar to the decay events from which they arise.) If one is to believe the literature, the statistical tests "prove" the thesis of constancy since the observed distributions of emissions cannot be differentiated from the (random) theoretic expectation. The tests, dating back to the classical ones of Rutherford and Geiger, have been largely limited to a very few non-serial tests such as the chi-square test of frequency distributions and the index of dispersion (sl/m) which is a measure of the variance of emissions compared to the best estimate of sigma squared-the mean of the expected Poisson distribution (4). In general these statistical tests have shown (as mentioned above) that the observed distributions of radioactive emissions cannot be differentiated from the random or theoretic expectation. However, each specific statistical test measures only specific characteristics of the observed distributions and, in general, these characteristics are not identical for the differing tests. Applied to radioactive counting, the conformity of observed distributions with the expectation (i.e., the lack of demonstrable and significant differentiation) using a single statistical test has generally been taken as "proof" that the underlying assumption of independence has been verified. All that can reasonably be concluded, however, from conforming results of a single test (e.g., probabilities of >0.05 or 0.01) is that the results are not inconsistent with the thesis of randomness and independence. If a series of numbers such as radioactive counts or times-between-emissions are in fact random, then each statistical test which measures at least one property of randomness must consistently show conforming results with an appropriately high frequency; the population of counts must be, within accepted probability limits, of the same population as theory would predict and as would result from randomly generated numbers themselves. In the absence of artifact, non-conforming results as shown by even one valid test are thus sufficient to raise serious questions as to the validity of the thesis of randomness of what is actually measured and to render the generality of this thesis untenable. Of course, the hypothesis that isotopic decay is independent of the environment cannot otherwise ever be rigorously proved, since it is patently impossible ever to test all possible conditions which might affect the decaying nuclei. Apropos of the above statistical argument, if confirmed exceptions to the general hypothesis are observed, one must seriously question the entire thesis. Much of the so-called literature "proof" of the thesis of independence was carried out early in this century when both the instrumentation and the statistical techniques were much less developed than they are now. It is thus of interest to note the work of the statistical experimentalist Berkson, who has reexamined some of the earlier work and who has concluded that the earlier evidence does not now appear to be as compelling as was once originally thought (5). In studying times-between-alpha-emissions arising from 241Am, Berkson, employing non-serial tests primarily, did not observe significant differences between the observed and expected distributions, although he did note what seemed to be a high correlation among consecutive times in one case. He concluded: ". . . can we consider this examination a fairly definitive establishment of the randomness of such emissions? I do not think so.... I had the impression that a quite extreme departure from randomness might be operative without its being detected by these statistical tests. . . ." (emphasis added). One of the more noteworthy "exceptions" is that of Kutzner, who observed during the 1920's consistently low values of a variance index when measuring alpha emissions. Even though his work was repeated and confirmed by Curtiss, it has been forgotten and/or ignored (6). Even today there is a strong tendency to ascribe trivial explanations to observations of changes in decay rates (7). Interestingly enough, most of the earlier "proof" of the thesis of randomness involved the use of alpha emitters alone; thus a further assumption has been made that—if alpha decay is random—all decay is random. 1. During desorptions of monolayers (monomolecular quantities) from aluminum and other metal (oxide) surfaces, the variance of the detected emissions was decidedly too low. Statistically involving approximately 1300 degrees of freedom, the probability that the observed distribution of detected beta emissions was of the (random) theoretic population was less than 10-14 . The observed emissions were too close to the expectation—the s2/m value was 0.717 instead of 1.000. 2. Further, when carboxyl labeled stearic acid-C14 adsorbed on heat-activated aluminum foil surfaces was counted, the variance index (s2/m) was again observed to be much too low when the metal substrate was allowed to "float" electrically or when a weak positive charge (90v) was applied to it. In these cases the probability that the observed distributions were of the (random) expectation was less than 10-8 over some 3300 degrees of freedom. When the same sources were grounded or charged at a negative potential, the observed distributions could not be differentiated from the expectation. Under these conditions, one can reach only one reasonable conclusion—barring artifactuality, the detected emissions are not of the random expectation. The deviations are a function of the environment. Later, in further work, we (JLA and GWS) observed that gamma emissions from cobalt-60 and cesium-137 sources, when measured using a sodium iodide external detector, were not properly described as random when the series of counts (detected emissions) were analyzed by linear regression analysis (9). There is, of course, a certain probability that a series of counts derived from a random process will appear to have a changing mean (i.e., a certain apparent slope) and a higher probability that the series will have substantially no apparent change in mean at all. The extent of the deviation of the apparent slopes, based on random deviates, is predictable theoretically. Thus, we analyzed counts of a large series (involving over 108 detected emissions) taken in 1024 automatically time-sequenced periods and observed that the variance of the apparent slopes of two homogeneous groups were considerably and quite improbably higher than they should have been for random events, while the variances of the slopes were improbably less than they should have been in two other sets. These results—involving over 108 detected emissions—were obtained even though the much more common chi-square tests and index of dispersion tests failed to differentiate the observed distributions from the expectation. These results are not consistent with the thesis of event independence. In other work we have observed that detected gamma emissions of cobalt-60 appear to be influenced by the environment such as by deliberate electrical fields placed about the sources (10). Further we have recently examined half-lives of short-lived isotopes under a series of differing environmental conditions. Preliminary evidence suggests markedly different half-lives than those predicted for independent nuclear processes. In many cases our studies are not yet complete. However we are each convinced that the thesis of decay independence and the thesis of "decay constancy" needs considerable revision and reexamination. Rigorous extension of our work to the area of radiometric dating has not yet been attempted. After all we have been examining the behavior of relatively long-lived radioisotopes over very short periods. However, the several observations of statistically significant deviations from the (random) expectation does rather strongly suggest that, at a minimum, an unreliability factor must be incorporated into age dating calculations. (1) W. F. Libby, Pensée (1973): 7. (2) G. T. Emery, "Perturbations of Nuclear Decay Rates," Annual Review of Nuclear Science 22 (1972): 165. (3) H. C. Dudley, Letters al Nuovo Cimento 5 (1972): 231. (4) E. Rutherford and H. Geiger, Philosophical Magazine 20 (1910): 698. See also, L. F. Curtiss, Journal of Research of the National Bureau of Standards, Section A, vol. 8 (1932): 339. R. D. Evans in The Atomic Nucleus (New York: McGraw-Hill, 1962). (5) J. Berkson in "Research Papers in Statistics," ed. F. N. David (New York: Wiley, 1966), pp. 37-54. (6) W. Kutzner, Z. Phys. 21 (1924): 281. Ibid, vol. 44 (1927): 655. Cf. L. F. Curtiss, Journal of Research of the National Bureau of Standards, Section A, vol. 4 (1930): 595. (7) Cf. J. F. Emery, et al., Nuclear Science and Engineering 48 (1972): 319. (8) J. L. Anderson, Journal of Physical Chemistry 76 (1972): 3603. (9) J. L. Anderson and G. W. Spangler, Journal of Physical Chemistry 77 (1973): 3114. (10) J. L. Anderson and G. W. Spangler, Bulletin of the American Physical Society 10 (1971): 1180 (abstract only).